Step right up to the acro-batiest show on earth in Aero the Acro-Bat! The madman industrialist Edgar Ektor has siezed control of the World of Amusement. He and a deranged cast of fairground freaks threaten the circus. 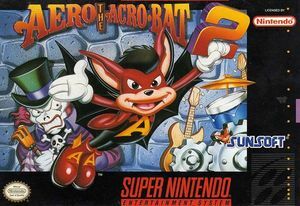 The only hope for survival is the high-flying, death-defying Aero the Acro-Bat! Spine-tingling terror unfolds as Aero tackles Ektor's wicked henchmen. Bungee jump into a battle with evil! Skydive in mode 7 toward the danger below. Hang on for the ride of your life as you rise and plunge on a roaring roller coaster! Tiptoe across a terrifying tightrope! Then power drill and twist Aero right through every sinister circus enemy imaginable. And all the while, the show must go on! The graph below charts the compatibility with Aero the Acro-Bat 2 since Dolphin's 2.0 release, listing revisions only where a compatibility change occurred.